Hydrogen peroxide (HP) concentrations of 4% and 10% are both effective for at-home bleaching, but 10% HP increased the absolute risk and intensity of tooth sensitivity (TS). The finding is from a study published in the May/June issue of Operative Dentistry. Authors designed the triple-blind, controlled, and parallel randomized clinical trial to measure the color change and risk and intensity of TS from at-home bleaching performed with HP gel in concentrations of 4% and 10%. The study’s primary outcome was the absolute risk of developing TS. The secondary outcome was color variation. Authors randomized all 78 participants into 2 groups: HP 4 and HP 10. All participants were instructed to wear a tray with the bleaching agent for 30 minutes twice per day for 2 weeks. Participants who wore the bleaching tray at least 28 times were considered 100% in compliance with the protocol. Two calibrated evaluators with agreement of at least 85% determined by weighted Κ statistics recorded the shade of each participant’s teeth at baseline, during treatment (after the first and second week of bleaching treatment), and 1 month after treatment. Authors evaluated color using Vita Classical, Vita Bleachedguide 3D-MASTER, and a spectrophotometer. They used the middle one-third of the facial surface of the anterior central incisor for shade matching. Authors measured color changes by calculating the change in the number of shade guide units that occurred toward the lighter end of the value-oriented list of shade tabs. Patients used a numeric rating scale (0-4) and visual analog scale (0-10) to record TS. Authors compared the absolute risks of bleaching-induced TS using the Χ2 test. They used the Mann-Whitney test to compare the intensity of TS from both pain scales. The ΔΕ data were submitted to a 2-way repeated measures analysis of variance, with the assessment time being the repeated factor. Authors found the adherence to protocol was 88% in the HP 10 group and 85% in the HP 4 group. In the HP 10 group, 25 patients reported some degree of TS during bleaching. In the HP 4 group, 15 patients reported some degree of pain during treatment. Authors also found that the HP 10 produced significantly higher risk of causing bleaching-induced TS than did HP 4. Two patients from the HP 10 group reported severe TS compared with no patients from the HP 4 group. Authors noted significant differences in TS intensity between the 2 groups based on the 2 pain scales used (P = .02 and P = .03, for numeric rating scale and visual analog scale, respectively). Color evaluation tools tended to show a higher degree of whitening for the HP 10 group than the HP 4 group in the first and second weeks of bleaching, but authors noted no significant differences between both groups 1 month after treatment. Anterior zirconia ceramic cantilevered resin-bonded, fixed dental prostheses provide excellent clinical longevity regardless of the cause of the missing teeth, according to a study published in the October 2017 issue of Journal of Dentistry. Authors designed the study to measure the long-term success and survival rates of cantilevered zirconia ceramic RBFDPs used to replace incisors. They also wanted to know if the reasons for missing incisors would influence these rates. A total of 87 patients with missing incisors received 108 anterior cantilevered RBFDPs made from zirconia ceramic. Patients were 61% female and 39% male. The ages ranged from 13 to 78, with a mean (standard deviation [SD]) age of 32 (20) years. A total of 59 patients received 1 cantilevered RBFDP, 21 patients each received 2 cantilevered RBFDPs, and 7 patients missing both maxillary lateral incisors received cantilevered RBFDPs splinted at the midline by connecting their retainer wings to maintain the orthodontic closure of a midline diastema. Authors grouped patients according to the reason for the missing tooth into 3 categories: congenitally missing (G1), traumatic incidents (G2), and other reasons (G3), including periodontitis, caries, and orthodontic treatment. The RBFDPs replaced teeth that were congenitally missing in 59.6% of the cases, missing because of traumatic incidents in 13.2% of the cases, and for other reasons in 27.2% of the cases. Authors used the Kaplan-Meier method to measure the success and survival rates of the restorations according to 2 failure criteria: debonding for success and loss of the restoration for survival rates. They used the log-rank test to compare the survival rates of groups for these 2 criteria. The mean (SD) observation time was 92.2 (33) months, with a minimum of 35 months and a maximum of 185 months. Authors recorded 6 debonding incidents and 1 lost restoration during the observation period. Four of 94 RBFDPs luted with Panavia 21 TC debonded (4.2%), and 2 of 14 RBFDPs luted with Multilink Automix Panavia debonded (14.2%). The success rate was 92% after 10 years when debonding was considered a complication. The 10-year success rate was 98.5% for G1, 76.9% for G2, and 89.2% for G3. Authors noted no statistically significant difference among the 3 groups (P = .128, log-rank test). When the loss of a restoration was considered a failure, the 10-year survival rate was 98.2%. Groups G1 and G3 had a survival rate of 100%, whereas group G2 had a survival rate of 90.0%. Ultrathin occlusal veneers are a conservative alternative to traditional onlays and complete crowns used to treat severe biocorrosive lesions, according to a study published in the July/August issue of Operative Dentistry. The authors detail a case of a 34-year-old man who sought treatment for dentin sensitivity and dental wear at the Department of Prosthodontics and Dental Materials at the Federal University of Rio de Janeiro, Rio de Janeiro, Brazil, in 2015. The case is part of an ongoing clinical trial of patients affected by moderate to severe biocorrosion. Treatment includes the use of composite resin and ceramic computer-aided design and computer-aided manufacturing materials. Authors used the bilaminar technique (lingual direct composite veneers with labial ceramic veneers) to restore maxillary anterior teeth and ultrathin computer-aided design and computer-aided manufacturing ceramic occlusal veneers to restore posterior teeth. Diagnostic casts were obtained from complete arch polyvinyl siloxane impressions. The patient’s bite was recorded at maximum intercuspal position, and casts were mounted on a semiadjustable articulator. A complete additive waxing was carried out in 2 steps. First, all teeth planned for restoration (maxillary arch: anterior teeth and premolars; mandibular arch: second premolars, first and second molars) were additively waxed, except for the canines. Both waxed models were then duplicated and poured with scannable stone. Mock-up restorations were fabricated intraorally to evaluate esthetics and vertical dimension of occlusion (VDO). Authors used multisport etching on unprepared enamel to boost retention of provisional restorations in poly(methyl methacrylate) resin. Authors then used splinted bonded provisional acrylic restorations for 15 days to measure the influence of the new vertical dimension of occlusion (+1 millimeter) in facial appearance and muscular comfort. The 4 posterior sextants were prepared at a rate of 2 per week, starting with the maxillary arch. Additive stone replicas (without canine waxing) were scanned first for correlation and then for the preparations. At the next appointment, authors milled the ultrathin occlusal veneers from lithium disilicate glass-ceramic blocks. They preferably located the sprue at the nonworking cusps: lingual (inferior arch) and buccal (superior arch). They also inspected the restorations for eventual cracks, marginal chipping, occlusal contacts, and general fit while they were in the precrystallized stage. Authors rebuilt the palatal surface of the 6 teeth with direct composite under rubber dam isolation. They limited preparation to refreshing the exposed dentin with a diamond bur at low speed (1,500 rotations per minute). After applying a total-etch dental adhesive, authors used freehand composite resin to recover the marginal ridges, cingulum, and palatal fossa. A patient who opted for a quick, do-it-yourself (DIY) approach to a “million dollar smile” found herself in an emergency dental clinic. Dental clinicians there carefully removed the reline and advised the patient not to consider such options in the future. Still, the lure of quick, easy, DIY cosmetic dental products remains. 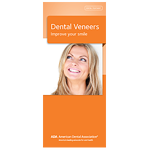 If you have patients who are considering veneers or are already ready to improve their smile, give them the ADA brochure, “Dental Veneers: Improve Your Smile” as an affirmation that they’re making the right choice. Dental Veneers explains the benefits of porcelain and composite veneers, as well as placement steps and factors to consider before opting for veneers. Dental Veneers also outlines the reasons to choose veneers, with before-and-after photos and illustrations of veneer placement. The 6-panel brochure is available in packs of 50 from the ADA Catalog. A sample can be viewed here. To order, call 1-800-947-4746 or go to ADAcatalog.org. The title is available personalized as well. Readers who use the 18412E code before September 21 can save 15 percent on all ADA Catalog products. Join us at ADA 2018 for an all-day, hands-on workshop with the American Academy of Facial Esthetics and learn to integrate dermal filler procedures into your practice. Dermal Filler Therapy for Every Dental Practice will provide you with the skills required to diagnose, select treatment plan and inject patients with dermal fillers. Earn 7 hours of CE hours upon completion. ADA CE Online offers courses on optimal esthetics. Learn from our experts the latest techniques to create perfect smiles. Check out these courses on ADA CE Online and be better prepared for your patients’ esthetic needs. The consulting editor for JADA+ Scan — Cosmetic/Esthetic is Luiz Meirelles DDS, MS, Ph.D., Dentsply Sirona Implant Fellow, Department of Periodontics and Oral Medicine, University of Michigan School of Dentistry.